At every course you will face an approach where the green is raised above you. These shots rank as some of the most intimidating, partly because you can't see the green and partly because you know upslopes sap distance. This is why the way to gain confidence and success with these shots is to have a clear picture of your target, and to use a stronger club than the yardage might suggest to help you get all the way back to the flag. 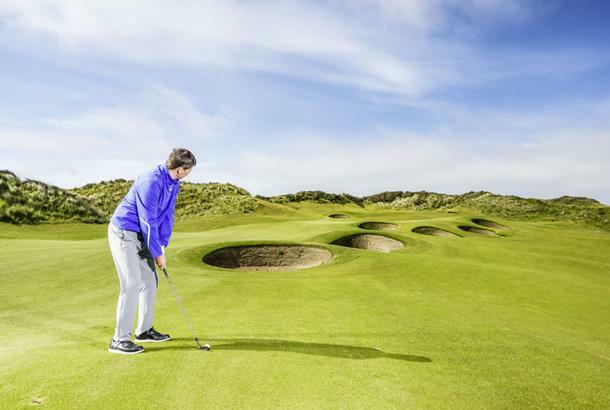 Follow these five pointers and you'll make the galling sight of the ball trickling back down towards you off the front of the green a thing of the past. Of course, upslopes add distance. And given the classic amateur error is to come up short, getting the ball all the way to the pin is the biggest task you face with this shot. The general rule here is to estimate how many yards you are below the green and add that to your yardage. But in selecting your club, remember most uphill shots have banks at the back that will return your ball back to the green. This often makes taking two extra clubs than normal – say a 6-iron instead of an 8-iron – a good policy. As with this shot, on uphill approaches it is often possible to tell if the pin is cut to the left or right of the green but front or back is not so easy. It's important to ascertain this because knowing your target helps you swing the iron you've chosen with commitment. Some golf clubs produce daily pin position charts; if you don't have one of these, invest in a distance measuring device. If you are still in any doubt, work out a yardage for the centre of the green – taking the upslope into account – and play for that. 3. BALL ABOVE OR BELOW? Check the ball's height, relative to your feet. It's very rare you'll get a perfectly level stance. Ball-above-feet – as in this case – has the effect of flattening the swing plane, which promotes a right-to-left shape for the right-hander. Ball-below-feet does the opposite, encouraging a more upright plane and a fade. The effect gets greater as the slope steepens, so make sure you use your alignment to take this into account. On this shot the pin is central on the green; but when the pin is tucked either left or right, missing the green on that side means that more than likely you will be faced with a pitch or chip that's impossible to get close. When the pin is tucked always give yourself some margin for error – even if you're playing well. Aim between the pin and the middle of the green and focus on getting the distance right; manage that and you won't be far away. Whenever we are faced with an uphill shot, the temptation is to try to hit the ball a little harder. Fight this instinct; trying to muscle the ball will only cost you timing and strike quality... and if they are missing you will definitely come up short. Instead, pick a club you know is strong enough to send the ball there with your regular rhythm, and focus on making solid contact from a well-balanced swing.